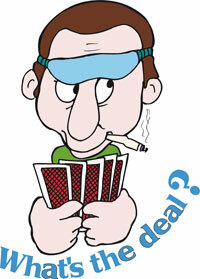 This hand caused headaches for at least one pair when played at the Lake Chapala Duplicate Bridge Club in Riberas. South, holding a powerful 2 suiter, started the bidding with his six-card diamond suit. North replied with 1 heart and South now bid 2 spades. Most players consider a jump shift of this nature to be 100% forcing to game but North wasn’t on the same wavelength and passed. As a result, the partnership played in a part-score while cold for slam, not an outcome you would want to repeat too often! The South hand is so strong that there should be a play for some game if North can manage to scrape up a response. To my mind the auction should have gone as in the diagram above. Some players may feel that the South hand is so powerful that it should be opened 2 clubs but I disagree – big 6/5 hands are notoriously difficult to describe after this opening. When North responds 1 heart, 2 spades by South says that the partnership must play at least in game somewhere (unless they double the opponents for penalties). North can now temporize with 2 no trump (or 2 hearts if a bit squeamish about not having a full club stopper!) When South next bids 3 spades, his distribution becomes much clearer: a 5 card spade suit with longer diamonds and at least game-going values. North now has a simple raise to 4 spades. But South is not finished yet - he has loftier aspirations in mind. His 5 club bid shows first round control in the club suit and says, in effect: partner, my hand is really terrific, take another look at yours and see if you feel slam may be on. Holding the heart ace, spade king and diamond queen, North should have no hesitation in jumping to the small slam in spades. The play in six spades is easy: win whatever is led, draw two rounds of trumps and watch that each opponent follows both times. When they do, just keeping cashing winners and let East take his good trump at any time. Admittedly, hands of this nature do not show up all that often but when they do it is a good idea for both partners to bid in harmony so I suggest you discuss this deal with your partners. If the South hand in question had small cards instead of the diamond ace and the club king, then I would have opened 1 spade and continued as though my distribution was 5 spades and 5 diamonds.